We're all guilty, but most of us don't even know what it is. n. Attribution of human motivation, characteristics, or behavior to inanimate objects, animals, or natural phenomena. American pets are getting naughtier by the minute. As the demand for dog behaviorists and for prescription medication to combat "Doggie A.D.D." and anxiety continue to escalate, we have to wonder who's to blame for this hazardous trend. To answer the question, we have to first understand the phenomenon behind treating pets as humans. As the number of kids per household declines, the number of pets is increasing. Baby boomers, a powerful segment of today's market, are quickly becoming empty-nesters and replacing their grown two-legged children with four-legged ones. Look no further than the proliferation of the term "pet parent" versus "pet owner." In fact, a full 83% of pet owners now call themselves their pet's mommy or daddy. One possible incubator of anthropomorphism leads directly to the burgeoning pet retail industry and the marketers who want your every pet dollar. Now a $43.4 billion annual jackpot for companies, (larger than the entire U.S. toy industry) pet care spending has reached unprecedented levels of growth and staying power despite a recent turbulent economy. "By buying pets human-type gifts, we are making ourselves feel good and making them happy," says Bob Vetere, chief operating officer of the American Pet Products Manufacturers Association. According to marketing strategist Lisa Lehr, this trend suggests a hugely profitable strategy for entrepreneurs in the pet business to position pets as members of the family. "People are eager to spend a lot of money on their pets. You might as well be positioned to receive your share," states Lehr. However, the unfortunate consequence is a misguided view of canine psychology that has given rise to undesirable dog behavior in thousands, if not millions, of homes across the country. Expecting dogs to think like humans is fairly widespread among pet owners. One reason that ancient Fido likely earned the title "Man's Best Friend" versus other animals was his remarkable ability to adapt his life to fit with ours. It is this very skill set that is likely the cause for our frequent misinterpretation of his intentions and motives. Dogs ultimately need rules, boundaries, and limitations. They are social creatures that crave structure and routine. When dogs live with humans, the humans set the structure and schedule (or lack thereof). For this modern relationship to succeed, we humans must provide leadership and guidance. To a dog, constant affection, gifts, and accommodations without rules, boundaries and limitations go against every grain in a dog's instinct. In other words, dogs need to be treated like... well, dogs. And, pardon me, for such a politically unpopular statement! All but the most chronic anthropomorphic dog owners can improve their relationship with their dog and ultimately their behavior if they make a valid effort to understand their dog's unique emotional makeup. Whereas throwing your dog a birthday party (hey, I've done it!) or filling a holiday stocking with treats is not a heinous dog-behavioral crime, people should be wary when their own actions impinge on providing proper timing, fair corrections, and effective positive reinforcement for their dog. When a dog is in any other state than being calm and submissive (e.g., if he's aggressive, obsessive, scared, hyper or anxious) and we give him a hug or pat on the head and tell him it's okay, it is comforting to us, but it only reinforces the state of mind for the dog, making the experience more intense. While we think we're soothing the dog, the dog thinks we approve of the inappropriate behavior (or even share it). Let's look at an example. Many dogs are naturally afraid of fireworks or thunder. During the experience, the dog is in a fearful or anxious state of mind and generally lacks confidence. If we step in and comfort the dog in a way we understand (e.g., hugging or baby talk), the dog sees it as a reward or confirmation of the fear or anxiety. This encourages his behavior and tells him he is right to be uneasy; it can ultimately intensify his original fear. Anthropomorphic "parents" often discover that their dog has separation anxiety (sometimes manifested by destructive behavior). If you constantly coddle your dog and fail to boost his confidence with rules, boundaries, and positive reinforcement training, your dog may be unable to relax when alone. When you leave him, the situation can cause so much mental anguish that he begins to take it out on your house, or worse, on himself. Owners may want to think twice before buying that $3,000 four poster canopy doggie bed and catering to their dog's every humanistic desire. Whether it's the pet marketers to blame, or the glut of Hollywood films now portraying pets as humans (have you seen Disney's Beverly Hills Chihuahua? ), giving dogs mixed leadership signals throws him off balance, confuses his psyche and ignites a canine imbalance. Whenever we try to evaluate canine behavior using human values we run the risk of misinterpreting our dog's emotions and motives, while making minor behavioral issues become chronic. So the next time you want to join the 63% of dog owners who engage in a little kissy-kissy with Fido on the bed, let the conventional disciplinarian in you take over and remind yourself that it's not only okay to treat your dog like a dog, but it's the best way to live in complete harmony with him. Michael Landa is the Founder and CEO of The Pet Staff, Southern California's largest and most experienced professional pet sitting, dog walking and dog training company. His staff of 170 pet experts caters to a demanding client base of over 5,700 Angeleno Anthropomorphists. 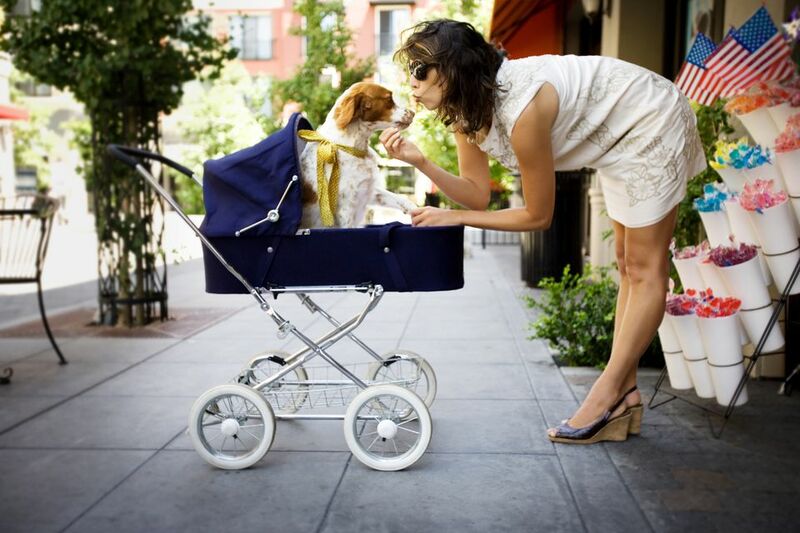 Landa lives in Hollywood with his "baby", Max, an eighteen-month old Labrador Retriever. Statistics Source: American Pet Products Manufacturers Association (APPMA) 2007-2008 Pet Owners Survey. "anthropomorphism" The American Heritage® Dictionary of the English Language, Fourth Edition. Houghton Mifflin Company, 2004. 03 Sep. 2008.